The Sublime, in art, was suggested to me in a tutorial last week. Something I've never actively looked into, with instead only a cursory awareness, the sublime can be read as something larger than ourselves, unattainable in anything other than experience. It is hard to define (by definition) and while the common use of the word has evolved to mean something akin to ‘very good’ it is actually a far deeper concept. In an attempt to better understand the sublime in art I read an online article that I found extremely useful. (Bell, 2013) Combined with a podcast and a few conversations with other students; What follows is an initial overview of the key points in the text interspersed with a few of my own thoughts. Bell speaks about the Sublime, to begin with, in regards to his practice. The interesting thing, for me, with the piece he has chosen is the chance element that the painting began with. Bell refers to “inviting a relatively random process” that felt like “reaching out to touch something other in my studio”. (Bell, 2013) This is a slightly romanticised version of one of the tenants behind my work in 2015, which evolved into my current explorations. He goes on to describe ‘randomising tactics’ used by artists since the 18th century to a sense of the sublime in painting. This is extremely relevant to my practice, although incidental. The use of found materials, actions, and marks brings an element of chance to the work, which is a form of unintentional randomisation. Richard Serra, (2005) The Matter of Time'. Weatherproof steel. Varying dimensions. 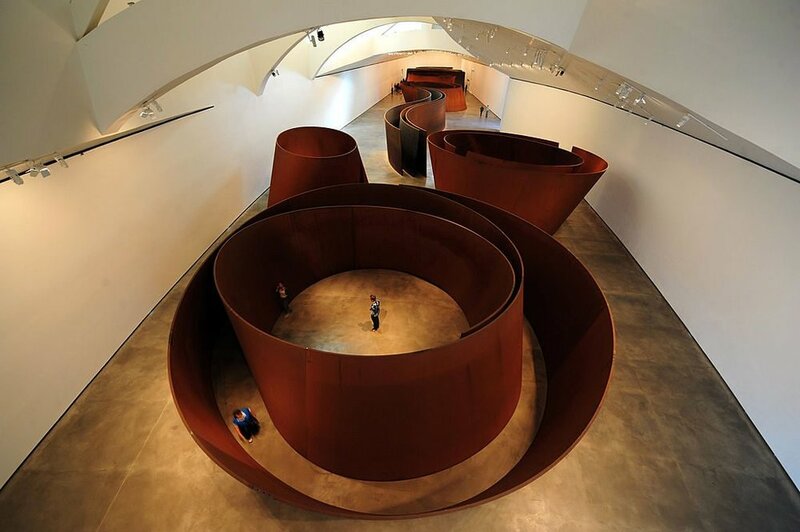 Richard Serra's large steel constructs invoke the sublime in size and relation to the viewer. A daunting otherness. (Bell, 2013) The viewer goes inside the artwork and is immersed in it. Bell discusses the sublime in capitalist society - which is a subject in itself that fits the definition of the sublime, as something wholly other, larger than ourselves which controls emotions. The need for more and the control that need has over us. Burke compared the sublime to darkness, an intangible feeling, best described by poetry. (Bell, 2013). He posited that we need a feeling of terror to achieve a truly sublime experience. Something found in oceans and by explorers on mountains. (West, 2015) There is, of course, far more to it than that, but this text marks is a cursory beginning to a subject with potential impact on my practice and understanding, with further research. Whitechapel galleries series - ‘The Sublime’ (2010) MIT Press. - This series is known for creating well-edited collections of texts, and sections of text, about a particular subject. Useful for leading to further reading. Bell, J. (2013) Contemporary Art and the Sublime.’ [Online] Avaliable from : http://www.tate.org.uk/art/research-publications/the-sublime/julian-bell-contemporary-art-and-the-sublime-r1108499 [Accessed 13.11.17]. West, S. (2015) ‘The Sublime’, Philosophize This!. [Podcast] Avaliable from: http://philosophizethis.org/the-sublime/ [Accessed 13.11.17]. What I think can be taken from these artists, and this text is the idea that art itself can be described as an exploration of the sublime. Many artists describe looking for something, often thought to be an answer of some kind. I believe this indescribable ‘thing’ can be compared to the ‘Artworld’ coined by Danto. These artists achieve in subject what art itself is, a ‘thing’ that we can sense is larger than ourselves (sight is a sense after all) that overwhelms the senses. I feel that there are other ways to explore this subject, and I'm sure that there are artists who do just that. A task for ongoing research. In my practice I feel the sublime can be a descriptor for the process of making, trying to capture something huge and unattainable, and something I am trying to convey to the viewer. On this last part, I am more sceptical, the sublime isn't a subject I've thought much about, but it feels like the right thing to say. The floor piece, the last work I am proud of in concept and execution, the sublime was a reference I hadn't intentionally explored. However it fits, the scale and location of the canvas alluded to a sense of the sublime, and the experience, however successful, was a sublime one. I feel that in one of the ideas I am working towards I begin to approach the subject once more, however it is in a much more subtle way. Too much subtlety though becomes tenuous, something I need to be aware of. I'm interested in the idea of the sublime in separation from scale. The other end of the discussion of the sublime in art is the notion of the unattainable something that art, must, therefore, always lack. If it is unattainable then it must not be attained and therefore lacking. However if the sublime can also be found in the experiencing (as a viewer) and contextual history of art, then the practice for whatever reasons is once more vindicated. We need the practice to be able to have the experience and the context, which is a route to the sublime through ‘Art’. In it's most practical terms - the sublime in my practice is the intent to create an experience for the viewer. Space is a factor in that, it has been for a while, and our studio/exhibition space in July will be an ideal location to test those theories with a large installation. In a smaller studio, the experience is shown through studio and reference to the enormity of process and practice. I've listened to a podcast from the series ‘philosophy bites’ on the sublime, and it was while listening to this I realised an important role the sublime plays in my artistic, and theoretical, practice. I live in England so cloud cover is common (as is rain but I won't mention that too much) so this state is a normal one for me, I feel comfortable, safe, and free to think. There are, however, many nights where the stars are visible. I've always had a complex relationship with the night sky, I was lucky enough to have a skylight directly above my pillow as a child, which I feel it is safe to assume, has led to my comfort under the stars. A feeling I'm sure I share with many others is that I don't feel insignificant when looking at the stars, and the information we can't comprehend that we find within them. Instead, I feel a sense of peace, of insignificance in it's purest form, a grounding feeling. This is my personal experience of the sublime, the difference in scale between myself and the entirety of space (which is what that blackness is after all) is incomparable in other parts of life. …….some thoughts take time to form. That visual references are removed while I figure out those thoughts (the phone goes in a pocket, not a tool needed for this) is not lost on me. In fact, it's one of the draws. We are overloaded with information during the day, in the light, especially when taking into account theories of visual culture. Time actively spent in the dark can counteract this, and I think frees up the mind to think. Retrospectively it seems foolish not to have articulated this process sooner. Another sign of the benefits of this module, something that will be explored in a coming essay.